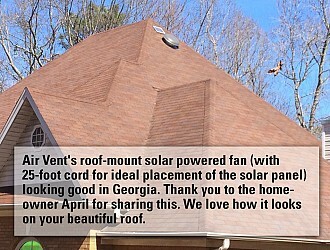 10-Watt Solar - Detached - Air Vent, Inc.
A smart alternative to conventional roof louvers, the Solar Powered Roof-Mounted Attic Vent operates during the day and collects power from direct sunlight to convert into electricity. In turn, this energy operates a high efficiency motor inside the power vent, so there's no added cost for electricity. That saves energy, which is better for the environment. And unlike most electric power vents regulated by a thermostat, the Solar Powered Roof-Mounted Attic Vent does not wait for the attic to get overheated before running. It operates whenever there is direct sunlight. 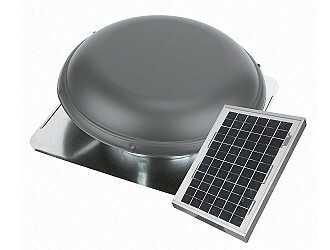 Solar Power Eco Friendly ProductThe solar vent operates without fuel, waste or pollution. And as a totally solar-powered solution, it’s also environmentally friendly. There's no need for electrical hook-up or electricity, simplifying the installation process. 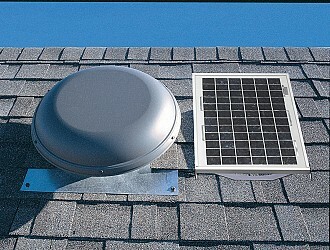 The Solar Powered Roof-Mounted Attic Vent features durable, high-quality, two-piece construction utilizing a solar panel to collect and deliver power directly from the sun to a high efficiency 24-volt DC motor inside the power vent. Unlike most electric power vents that are regulated by a thermostat, the Solar Powered Roof-Mounted Attic Vent works continuously from sunrise to sunset, under direct sunlight, keeping the attic ventilated all day long instead of waiting for the attic to get overheated. The solar panel can be mounted next to the dome or, because the panel comes with a 10-foot cord, you can mount the solar panel at another location on the roof to optimize solar collection while placing the dome in an inconspicuous location on the roof. 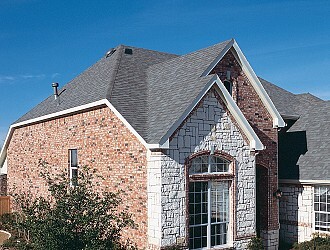 * For larger attics, multiple solar powered attic vents can be installed.